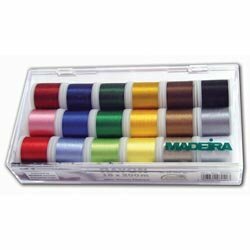 Madeira Aerofil All Seasons Thread Kit contains multiple color choices of the Madeira Aerofil polyester sewing thread. Includes 18 vibrant colors on 220yd (200m) spools. The spools come protected in a handy plastic storage case to keep thread dust free and organized.